Good news and bad news. I had planned to film a short video showing you how to make a pallet garden, but the weather didn’t cooperate. I was stapling the landscape fabric onto the pallet when it started drizzling and got really windy. That’s the bad news. But I know I promised a tutorial today, so I took photos and have kept my word to share how to make the pallet garden. I tried to be as detailed as possible. That’s the good news. 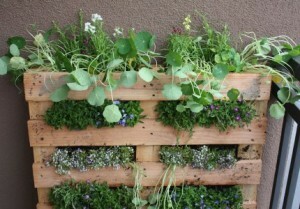 So keep reading my pallet loving friends, instructions on how to make your own pallet garden are just a few lines away.